There are so many strange facets of the Donald Trump campaign that at a certain point you'd think that your jaw couldn't drop any lower. Well, make sure you've mopped, because your chin is about to hit the floor: one of the campaigners in Trump's New York operation is attacking the Khans — still. The Trump campaign's New York co-Chair, Carl Paladino went after the Khan family last week, saying Khizr Khan "doesn't deserve" the title of a Gold Star parent. On Monday, in an email to BuzzFeed, Paladino doubled down on his accusations against the family of the fallen U.S. Army Captain. The Khans, who lost their son Humayun Khan in 2004 during the Iraq War, have become household names after they spoke out against Trump at the Democratic National Convention in July. In the email, Paladino made several wild and unsubstantiated accusations, including that the Khans were paid to speak at the DNC, and that Khizr Khan has ties to terrorist organizations. 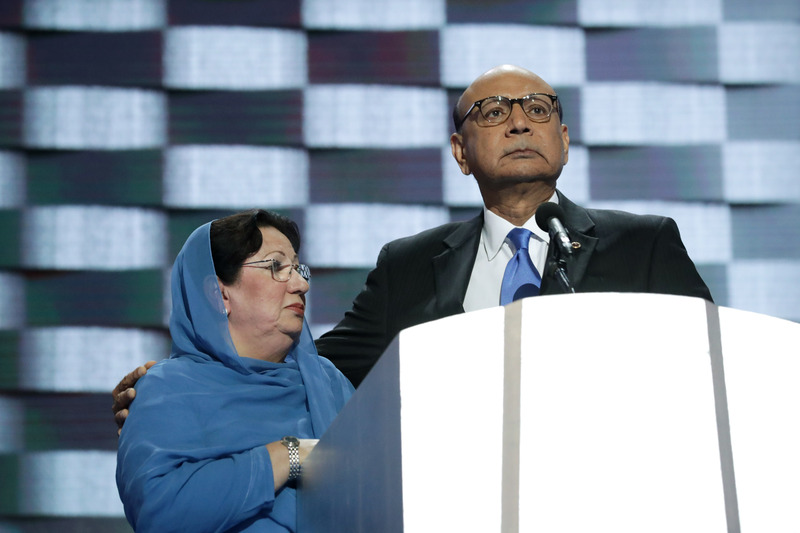 After the Khan's forceful speech at the DNC, where he accused Trump of not having read the U.S. Constitution, Trump hit back, saying it was inappropriate of Khan to criticize him and suggested that the reason Khan's wife, Ghazala, did not speak at the convention was due to their Muslim faith. The Khans responded giving interviews and writing op-eds. It seemed as if Trump had moved on from the Khan's before Paladino revived the controversy last week. This latest email from Paladino just begs the question: are you kidding me? To me, Paladino's email reads like it was written by someone who has a wall in his basement with news clippings and strings and frantic theories written in Sharpie with a lot of ??? and circled many times. The law firm (Hogan & Hartson and Lovells) for which Mr. Kahn worked COINCIDENTALLY is also the law firm for the Royal Court of Saudi Arabia, the tax lawyers for Bill & Hillary Clinton (and the Clinton Foundation) and also where Loretta Lynch worked. In addition, they also represent a small tech firm in Denver, CO. (yes, the same little firm that "managed" Hillary's private server)"
The COLLUSION AND CORRUPTION of Hillary RUNS DEEPER THAN IMAGINABLE. I'm not sure exactly which way this metaphor should work, but the Trump campaign either needs to get Paladino out of the bunker or stick him in it — and definitely not allow him to speak for the campaign.